The house takes a long time to warm up. I pull the sofa in close to the fire and layer up with jumpers, scarf and blanket, awaiting the chill to leave the air. On the dining table by the large window looking south over the voe, I lay out my books, with plans first to disappear into someone else's nature writing and find myself in a landscape very different to the one in which I grew up. I'll come back to what this weekend of solitude was meant for later. Through the night I wake frequently with hail and wind sweeping across the shallow slope of roof above me. A black panther also wakes me. I'm afraid of it's intense stare while it stalked before racing towards me. It refused to back away despite the noise I made in an attempt to scare it. I check the fire, opening the flue then the rayburn door - in that order - to minimise the reek (smoke) which inevitably I still notice afterwards floating through the room. Back under layers of duvet and blanket. Light off. 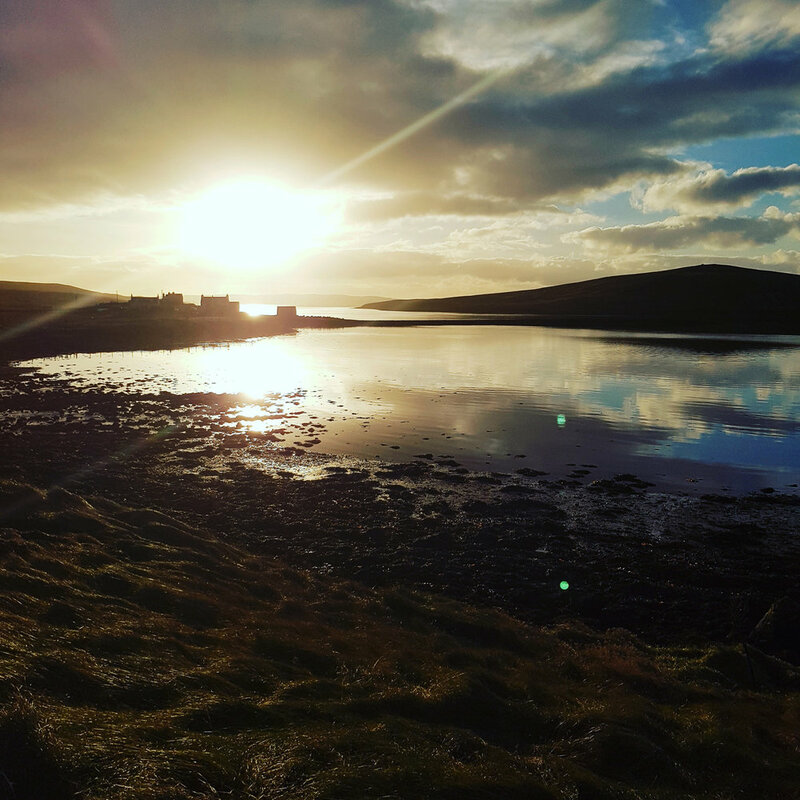 Around midday the wind suddenly drops, the water in the voe becomes smooth, reflecting the low but incredibly bright sun. A walk down the road and in along the banks to the old pier below the Nort' Haa, quickly reveals the boots, which I've chosen from the row that sit inside the front door patiently waiting for their shot at adventure, have several holes in them. With heavy skies of rain and hail approaching, and knowing that the ground over which I planned my route to the other side of the voe is only going to get more waterlogged, I turn for home again. The warmth hits as soon as I step inside, along with a suffocating urgency to strip away jacket and scarf which, though so necessary and appreciated in the icy air outside, suddenly become restrictive and claustrophobia inducing. I settle down in front of the view and adjust to the comfortable temperature. A strange popping clunk interrupts my gazing toward distant hazy hill upon hill. Then another couple of pops, slighty muffled this time, followed by that noisy call geese make when rising into startled flight. I briefly look for shooter and target, but the light is diffusing edges and blending land and landmarks into a pale softness. The light at this time of day, this time of year, when filtering between banks of cloud, creates the feeling of a soft blanket being laid down gently, settling land and sea in for the long dark night to come. It draws me inward and causes me to reach for pen and paper, to express and release my own experience of the sensation of place and home. To put into words, and to understand my relationship with these islands whose sea water and peat smoke, at times, feel like they flow through my veins.